Tansy ragwort is a biennial or short-lived perennial plant that can grow up to 6 feet tall. It reproduces by seeds and from lateral roots. Seeds germinate in the fall or spring and develop into rosettes the first year. Leaves are serrated, deeply lobed, and grow up to 9 inches long. In the second and subsequent years, plants produce multiple branched stems, with smaller lobed leaves arranged alternately along the stem. Numerous small flowerheads are produced in dense clusters at the ends of the upper branches. The individual flowers are bright yellow with 10 to 15 petal-like flowers surrounding a button-like center of tiny disc flowers. Tansy ragwort has a short taproot that produces many spreading side roots. Type and Class of Livestock: All classes of sheep and cattle. Little information about the use of goats. Grazing Objective: Prevent seed production and destroy seedlings and rosettes. 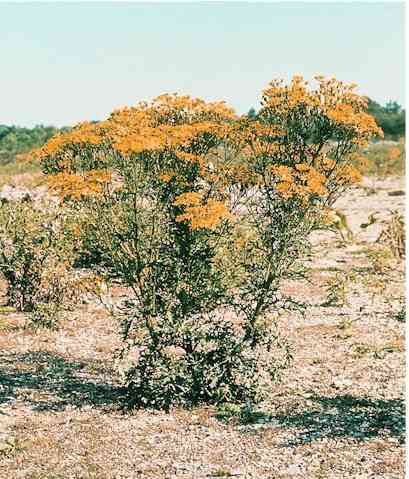 Growth Stage for Treatment: Best results are achieved when tansy ragwort is grazed in the rosette and bolting stages. Multiple defoliations during the season may promote a multiple-stemmed, perennial habit. Continuous or rotational grazing is better than a single treatment of short-duration, highly intense grazing. More than two years of successive grazing are needed to achieve adequate control. Potential Effectiveness: Grazing at the rosette stage is considered to be the most effective time to control tansy ragwort, resulting in reduced plant density and height, defoliation of stems, and reduced seed production. Most sheep readily graze tansy ragwort, which is considered good sheep forage when comprising up to 50% of sheep diets. Multi-species grazing of sheep and cattle is effective in grass pastures infested with tansy ragwort. Grazing combined with vigorous perennial grasses competition provides the best management of tansy ragwort. Betteridge. K., P.G. Mcgregor, D.A. Costall, and P.G. Peterson. 2000. Biological control of ragwort: Does sheep grazing affect ragwort flea beetle? New Zealand Plant Protection 53:54-58. Available at: http://www.hortnet.co.nz/publications/nzpps/journal/53/nzpp53_054.pdf Accessed 03 September 2006. Integrated Pest Management Practitioners Association (IPMPA). 2000. Tansy ragwort. IVM Technical Bulletin. Available at: http://www.efn.org/~ipmpa/Noxtansy.html. Accessed 03 September 2006. Sharrow, S. T. and W. D. Mosher. 1982. Sheep as a biological control agent for tansy ragwort. Journal of Range Management 35:480-482. Sutherland, R.D., K. Betteridge, R.A. Fordham, K.J. Stafford, and D.A. Costall. 2000. Rearing conditions for lambs may increase tansy ragwort grazing. Journal of Range Management. 53:432-436.